Miriam Unterlass studied chemistry, materials science and process engineering. She holds a Ph.D. in polymer chemistry and after a postdoc in the field of polymer physics at ESPCI in Paris, she moved to TU Wien. There she established her junior research group “Advanced Organic Materials” crafting a connection between the Institute of Materials Chemistry and the Institute of Applied Synthetic Chemistry. Classical polymerization conditions consume high amounts of energy and employ toxic and expensive solvents and catalysts. In contrast to this methodology, Miriam aims to generate high-performance materials through non-classical, hydrothermal processes using water as the only reaction medium. These eco-friendly techniques enable the synthesis of interesting polymers with unprecedented properties and crystallinity. 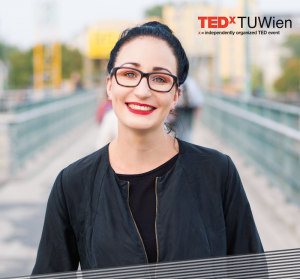 This year Miriam is going to share her ideas about polymers, especially for high-performance applications, at TEDxTUWien.